Margaret Wendt thought living in L.A.'s historic Hancock Park district would be a dream. Instead, more often than not, she's waking up to a smelly nightmare in her carefully landscaped backyard. Wendt says every few days, city-owned trees are puncturing her underground pipes, sending the noxious contents bubbling onto her patio and garden. NBC4 asked whether she meant raw sewage. "I’m not trying to be funny, but it looks like the Jolly Green Giant went to the bathroom out here," Wendt said. 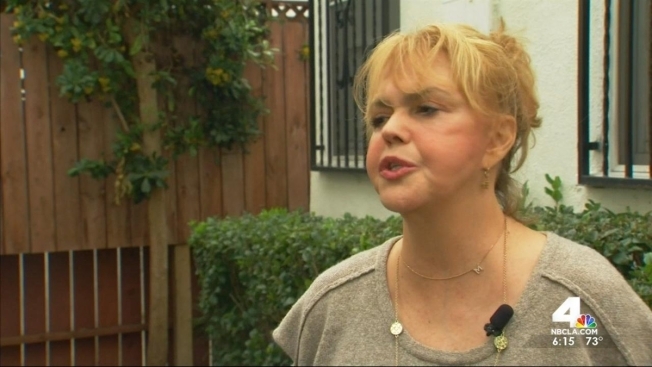 Wendt’s handyman, Cesar Delgado, told NBC4 that roots from the enormous trees planted on the parkway in front of her Larchmont Boulevard home have found an oasis in her cracked, old underground sewer pipes. NBC4 asked Delgado if the roots are looking for water, if they’re going into those pipes to get the water, and if they’re also getting fertilized by all that sewage. "That’s why they’re healthy," Delgado said. Delgado ran a special camera 13 feet down into the sewer line, showing NBC4 the tree roots that repeatedly poke through the pipes and clog the passage of toilet paper and other materials. "We just cut them two weeks ago and they grow back again, you can see," explained Delgado. Wendt has been battling the root problem for more than a year, spending a small fortune to fix the pipe damage, and clean up the mess caused by the raw sewage. "In the last year and a half, (I’ve spent) $37,000 dollars," she said. Wendt has made repeated calls to the city, asking for the tree to be removed, but she’s gotten nowhere. "The people in the city don’t care," she said. "The supervisor said 'Sorry, your problem.'" NBC4 took Wendt’s complaints to acting Superintendent for the L.A. Department of Street Services Ron Lorenzen. "The property owner is responsible for the sewer lateral," Lorenzen said. When asked if the city removed any trees based on this kind of problem, Lorzensen said: "Not to my knowledge. To my knowledge this is the property owners’ responsibility." As for whether the city is liable for any damages caused by public tree roots, the I-Team reached out to the L.A. City Attorney’s office for answers. Spokesman Rob Wilcox said before any damages are paid, it must be proven that the tree was planted by the city, not by a developer or a previous homeowner. Wilcox also said an investigation would be conducted to determine if the roots are to blame for broken pipes; if the pipes are leaky, the water may actually be attracting the roots, in which case, Wilcox explained, the city might not be culpable. In the meantime, Margaret Wendt is afraid to use her bathroom, because with every shower or flush of a toilet, she may unwittingly trigger a brand-new sewage spill. "I can’t even really live like a human being," she said. "I basically just have somewhere to sleep." If you have a problem with a public tree, you can contact the city by dialing 311.